This variety has been a popular plant from the late 1600's. 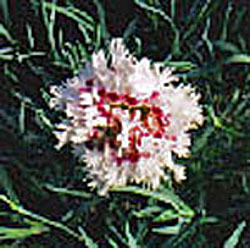 The double flowers have fringed white petals with a crimson eye. It forms mats of narrow, grey-green foliage and is very fragrant. Categories: All Items, all potted plants, More..